Goodness what a week! Thank you so much for all the wonderful warm thoughts on Karma’s dental surgery! I had a few people let me know that it really wasn’t a big deal at all, and their dog had teeth pulled and were fine the next day. Hmmm – maybe my girl is a big baby (ok, she IS) but she was so grumbly growly for the past five days and was not happy at all! They had only given her the one pain shot for the surgery, so we got a few more pain pills and that did help. She’s been really enjoying the soft food she’ll get for another few days – though mum is not enjoying cleaning up after this with an incontinent dog, so we’ll be happy when this is all in the past! 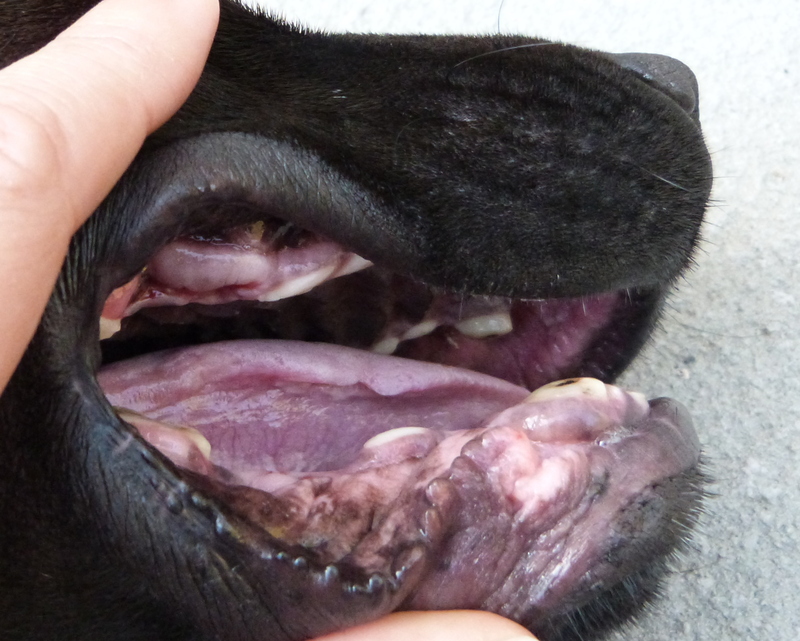 Karma had three large molars removed, and several more of the rotten ones were shaved down. She’ll have to undergo this a few more times as the remaining teeth worsen with age, but they wanted to keep as many as they could in there for now! My nick name for her used to be my little Baby Bear (because I’m from Montana and I think she looks like a little black bear) but now I’m calling her my little Gummy Bear. Or Toothless. She’s not fond of either of these new names for some reason. Does anyone else have a dog that eats dirt when it’s in pain? I did some research and it’s referred to as “Pica” – meaning the craving and eating of non-food items. Well, we sure have had our hands full trying to stop our kid from shoveling every bit of dirt and rock out of our yard into her mouth this week. UGH! She doesn’t really do this normally (unless there is some tasty bunny or possum poo hiding in it) but when she’s in pain or frustrated she turns into a Staffy Bulldozer Terror. I’ve had dogs in the past that ate grass when they had tummy upset – but she ignores the grass and inhales as much dirt as she can until we pull her away. Yeah, nice. So we’ve limited the back yard for now and potty breaks have been highly supervised. Luckily she’s finally feeling better today and I think we’ve moved past this strange craving! And in other news I must be the last person on the planet to have finally received my Windows 10 update because there it is flashing on my screen – so we’ll let it upgrade and Karma and I will go for a little bush walk meander on a lovely spring day and take some photos of our adventures! This entry was posted in Karma and tagged dental surgery, dog, Gummy Bear, incontinent dog, karma, pica, tooth extraction, toothless. Bookmark the permalink. Aw bless her 😦 I am glad she’s feeling better, and can completely understand her being grumpy. Kasper is very quick to get sad and growly when he’s hurting, too. Can’t help with the soil eating…could it ease the pain in her mouth somehow?? Aw don’t worry about it 🙂 Oh it’s so sad when our dogs do something that makes us realise how difficult their pasts were…poor Karma.